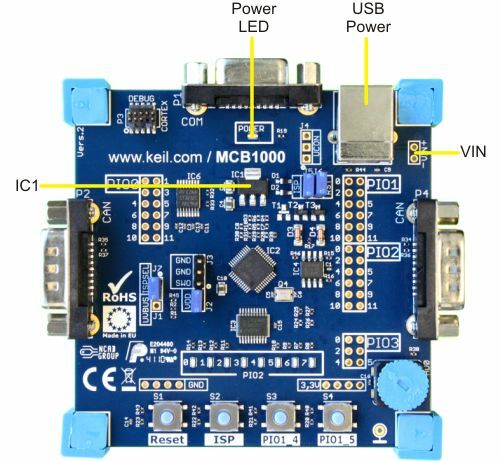 Power is supplied to the MCB1000 board from your PC using a standard USB B connector, or from an external 5VDC power supply connected at VIN+ and VIN-. The voltage regulator (IC1) regulates USB or VIN voltage to 3.3VDC. The Power LED indicates that 5VDC power is present on the board. Caution: Do not attach additional power supplies (such as batteries) while the USB supplies power to the MCB1000. This may harm your PC!